Vodafone apologises to customers, Great! Today I received an email from Vodafone (as probably all other customers did) from Australian CEO Nigel Dews. Nigel goes on to explain that he and the company are apologising for customer dissatisfaction and problems experienced over the past year. They go on to explain growth has been fast, and probably too fast for their current infrastructure. 3G data speeds was mentioned a few times and I got the feeling this was a central issue being explained. Like many other Australian’s I jumped on the iPhone bandwagon, and Vodafone seemed to offer good deals around 2 years ago when signing up. But I must admit, 3G data speeds from Vodafone have been pretty bad! I live and work in Sydney CBD, and you would think the infrastructure and coverage/signal in the city would be of high standard. Sometimes at night when I am accessing the internet on my phone the service speed is shockingly slow. Sometimes taking minutes to load a page, and often just ‘timing out’. It gets so bad I become frustrated, that in 2010 I am subjected to dial-up internet speeds! I am often moving around my apartment to find the ‘hot spot’ where data reception is good. I know leaving my phone in the middle of the couch generally gets a speedy enough service to load a webpage, in 30 seconds. Am I the only one experiencing this issue? Surely not. Then last week I took a trip out to the burbs’, around Paramatta way and I was finding 3G speeds on Vodafone to be fast, I was shocked at how fast it was. Maybe living in Sydney City and the constantly slow data speeds – I just became used to such a slow service and looked forward to getting into work in the morning if only for the fast Wi-Fi.. geez.. 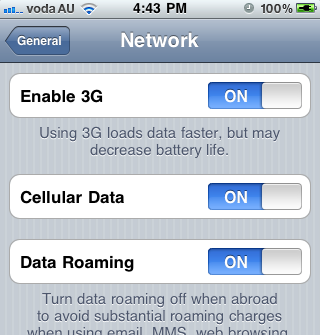 This is how I’ve always had my iPhone settings (with data-roaming ON) – is this going to allow fastest speeds possible? I also wonder if the issues over the past year have only been in high use/ growth areas, ie major metropolitan cities, or Australian wide? That was all a bit of a rant, and I haven’t even got onto missing TXT and MMS messages I send, but my recipient doesn’t receive. Anyway – good on you Vodafone, I am happy to hear issues and problems being acknowledged and promises of network upgrades and infrastructure.